From chair backs with wings and spine-supporting curves to furniture with padded seats and cabriole legs, the Queen Anne style epitomizes antique furniture. 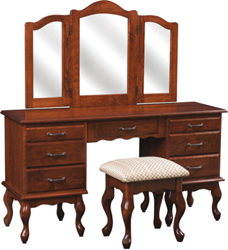 The ornate Queen Anne Dressing Table epitomizes the beauty and charm of Queen Anne furniture. Queen Anne furniture from Brandenberry keeps the look and feel of antique furniture alive. If there’s one style of furniture that’s synonymous with ‘antique,’ it’s the Queen Anne style. But furniture aficionados who do not have Queen Anne furniture dating back two or three centuries need not fear. Brandenberry Amish Furniture of Shipshewana, Indiana, is keeping the antique furniture movement alive with a collection of Queen Anne furniture. The Queen Anne style developed in the late 17th century to early 18th century England, and is named for Queen Anne. The style represents a blend of several influences, including Baroque, classical and Asian. It’s no coincidence that Queen Anne furniture sports a light and dainty look and feel. Because the furniture developed when socialization in the home (such as drinking tea) grew in popularity in England. This explains why Queen Anne has features like chairs with padded seat, shoulder-hugging winged back, and spine-supporting curve. In fact, the Queen Anne is believed to be the first ergonomically designed chair. Several other features give the Queen Anne its distinctive look. These characteristics include the wood fashioned in C-scroll, S-scroll and S-curves. Restrained ornamentation, usually shell-shaped, is another big feature. But if Queen Anne furniture has a trademark feature, it’s the cabriole leg. This shape is distinguished by a convex shape at the top and a concave shape at the bottom. Plus an ornate foot. Brandenberry Amish Furniture offers numerous Queen Anne pieces. They include vanities and dressers, secretary desks and jewelry armoires. Yet, Queen Anne furniture from Brandeberry is superior to most furniture normally found in most franchise furniture stores, big box stores and online stores. That’s because skilled Amish cabinetmakers custom-craft each item of furniture. And the Amish builders use quality regional hardwoods, such as oak, maple, cherry and hickory. As a result, with proper care, the furniture can easily become a family heirloom. Queen Anne furniture from Brandenberry can be ordered online or customers can visit Brandenberry’s ‘brick and mortar’ store in Shipshewana, Indiana. The store is located at 1045 N. State Road 5 in Shipshewana, at the intersection of State Road 5 and US 20, near the Indiana Toll Road. The store is open Monday through Saturday from 9 a.m. to 5 p.m. and by appointment. Brandenberry Furniture opened its doors in 2008. The Brandenberry Furniture concept allows customers to design the furniture of their dreams…to explore the rich woods and stains that only nature can offer. Nothing matches the feel, the smell and the weight of hickory, oak, cherry, maple…real woods that come to life in an Amish handcrafted piece. They are meant to last a lifetime and beyond. Whether a customer’s favorite style is Mission, Traditional, Modern or something in between, if Brandenberry Furniture doesn’t carry it, their craftsmen will build it to specification. Brandenberry Furniture offers everything from bedroom and dining collections to home accessories, patio and exclusive furniture pieces. Browse our easy-to-use website with detailed photographs and information, and you’ll find furniture categorized by room (including family room, dining room, bedroom, office, children’s) as well as by wood species (including oak, hickory, cherry, elm, maple, pine and cedar) and style.